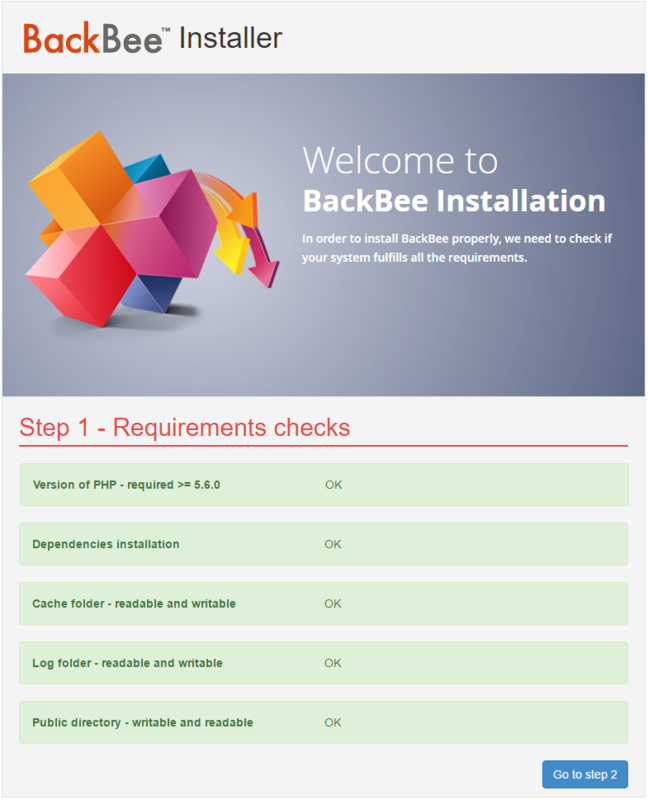 Make sure you have basic knowledge of PHP5, Apache or Nginx and MySQL to install BackBee. This documentation showcases 2 different ways to launch the install. Download the zip archive and extract its contents into your webserver at a convenient location - web root folder or subfolder - for example /backbee. Then open your browser and navigate to the URL pointing to that specific folder. You will be automatically redirected to the install procedure described in the Web Installer section. Need more details on those first steps ? We created a video tutorial specifically for WAMP users. First, you have to get the project by using Composer. Then browse to the URL http://localhost:8000/install.php and follow the instructions detailed in the next section. Detailled steps for command line users are explained in this short video. The cache/, log/, repository/Data/, public/ and repository/Config folders must be owned by the apache or nginx user. If this user is unknown then set the rights to 0777. Refresh and modify your environment until everything is green so you can go to the second step. 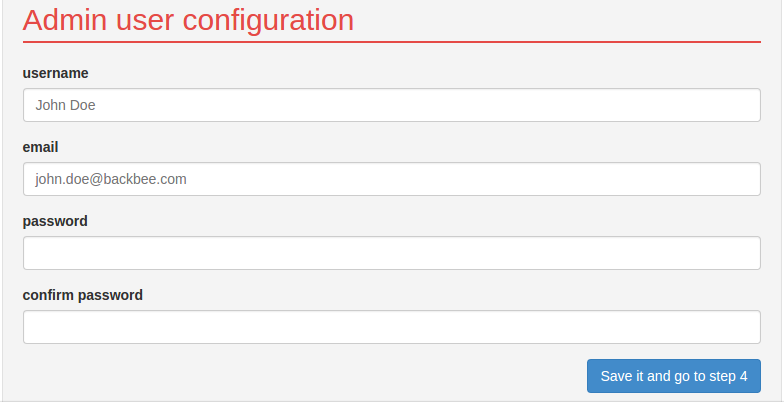 If required, set folder rights to be 0777 for repository/Config and then go to the third step. 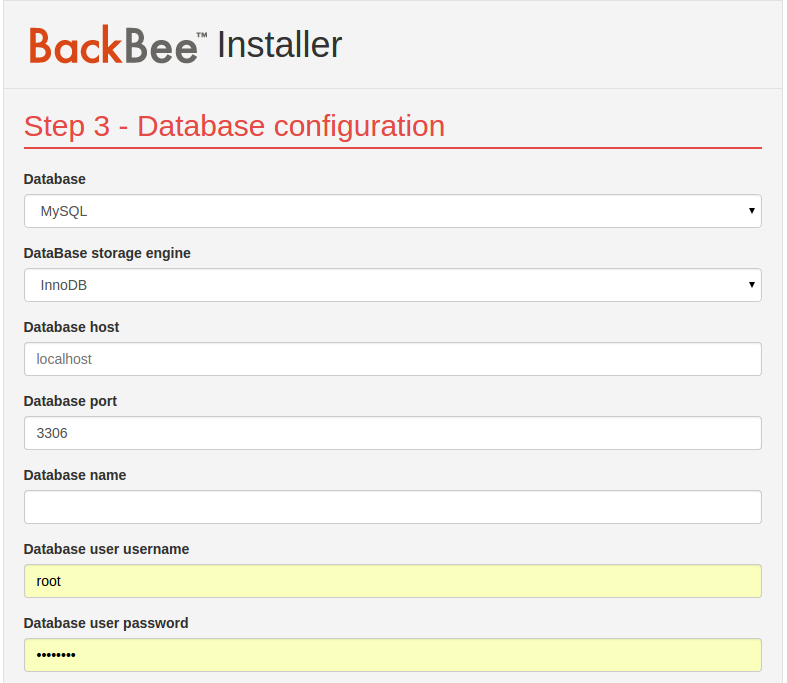 BackBee Installer automatically creates and populates the database. The only thing you have to do is to set your database settings. Note that we highly recommend to use MySQL or MariaDB. You also want to define your super admin user, fill the credentials then save and go forward to the fourth step. As last step, you have to choose your site name and fill its URL. 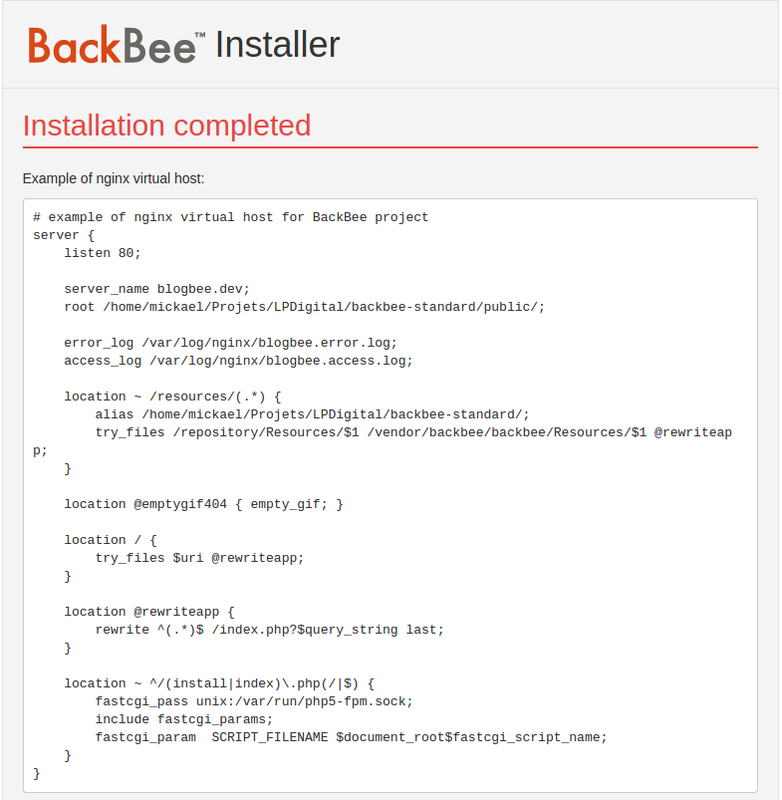 At the end of this step, BackBee will create an empty file named INSTALL_OK in the public/ folder. As long as this file exists the installation cannot start. So if for any reason you want to re-run the installation process, you have to remove this file first. Installation is now completed. BackBee generates and provides the Apache2 or Nginx virtualhost configuration. To get the best experience of BackBee CMS, we recommend you to setup the one that match your environment. 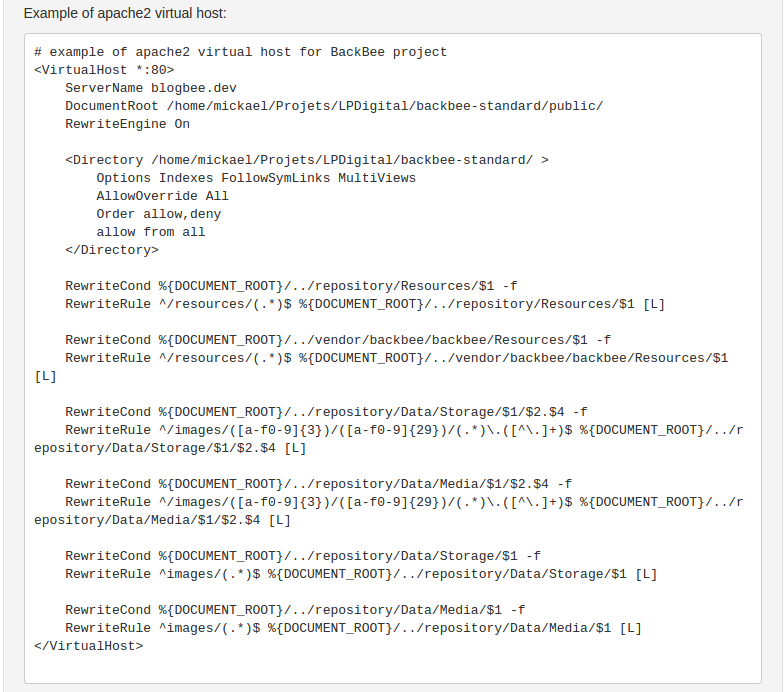 When your web server is set up, you can start using BackBee with the URL http://blogbee.dev. You can switch into edition mode by pressing simultaneously CTRL + ALT + B. The expected credentials are these you setted up at step 4. You can choose the number of articles and categories to generate by respectively changing 20 and 5. This is due to the user which executes PHP. He has not the right to write in the session's storage folder. You can solve this by using the command chmod or changing the session storage folder. You can also take a look at puphpet/puphpet#1195 to learn more about this issue.